By this time next week, we’ll know the new fall line-up for the 2013-14 television season and learn the fates of several series that are “on the bubble” — up in the air. As of now, here’s the status of shows with Asian American regulars. On CBS, “The Job” (Lisa Ling) is canceled; “Elementary” (Lucy Liu), “The Good Wife” (Archie Panjabi), “Hawaii-Five-O” (Daniel Dae Kim, Grace Park and Masi Oka), “The Mentalist” (Tim Kang), and “2 Broke Girls” (Matthew Moy) are safe. Mid-season replacement “Friend Me” (Parvish Cheena) never aired. The survival of “Rules Of Engagement” (Adhir Kalyan) is iffy. The network announces its schedule on Wednesday the 15th. Over at NBC, “Animal Practice” (Bobby Lee) is long gone. “Grimm” (Reggie Lee) has been renewed. Up in the air: “Community” (Danny Pudi, Ken Jeong), “Go On” (John Cho, Suzy Nakamura), and “Parks and Recreation” (Aziz Ansari). The peacock lets us know Monday, May 13. The following Fox series have been renewed: “Bones” (Michaela Conlin), “Glee” (Jenna Ushkovitz), and “The Mindy Project” (Mindy Kaling). Mid-season replacement “Goodwin Games” (Melissa Tang) will finally air on May 20, a full week after the network announces its new schedule on the 13th. The CW has given “Beauty and the Beast” (starring Kristen Kruek) another year, but so far, not “Nikita” (starring Maggie Q) nor “The Carrie Diaries” (Ellen Wong). Those actors are awaiting Thursday, May 16. Of those shows fighting for their survival, I’m most concerned about “Nikita,” “Community,” and “The Neighbors.” The first one seemingly reinvents itself every season by changing the parameters of what it’s about yet still manages to remain intriguing. The second one is funny in inventive ways. And the ABC comedy is notable for the romance between the teenage alien character Reggie Jackson (Tim Jo) and the human teenager Amber (Clara Mamet). 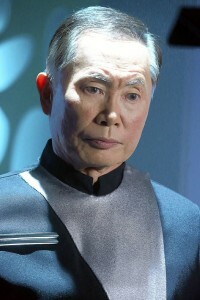 George Takei played the leader of the aliens — and the grandfather of Tim Jo’s character, Reggie Jackson. It’s as if the writers threw caution to the wind and decided to just have a good time because they might not get another chance to write these fun characters. The long hanging subplot of Reggie and Amber getting together finally happened. In the beginning of the episode, he told her he was going to tell his girlfriend Gisele that he is an alien. Amber later came to his bedroom, admitting he was right. But all she could muster was that it’s great he’s going to tell Gisele his secret. Reggie tried to but stumbled and figured the only way was to show her (boy, that would’ve been fun to see!) by clapping his hands and turning back into his green self. But news of Takei’s arrival interrupted it at the last second (darn!). In just the previous episode, Gisele knew Amber liked him and warned her she was going to fight to keep him. But in the finale, knowing he might have to leave Earth, Reggie—in front of the two girls–admitted he loved Amber. Gisele didn’t argue or ask any questions. She just asked to leave with her dignity (her turtle named Dignity, that is). The producers ran out of time to resolve it more naturally. It was too rushed. Tim Jo and the columnist at the East West Players gala. Just as Reggie and Amber were about to finally kiss, Grandfather (Takei) walked in, looked at what he interrupted, and exclaimed his patented “Oh myyyy!” Very funny. Finally, after Grandfather and his space ship departed, the two finally kissed. Amber asked, “Wow! Two tongues?” “You know it,” Reggie replied, walking away triumphantly with a smile and snap in his walk. “It’s gonna be an interesting summer!” she said, nodding. It closed out with some funny “Star Trek” vs. “Star Wars” inside jokes between Takei and Mark “Luke Skywalker” Hamill as Commander Bill. 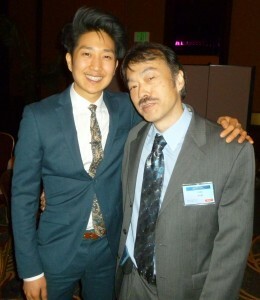 I was fortunate to talk to Tim Jo at the annual East West Players dinner last month. I told him that my organization, MANAA, had sent a letter to ABC President Paul Lee giving him all kinds of statistical reasons to renew “The Neighbors,” and that Paul asked an executive to call me to thank me for it. Jo already knew of my support because he made what people in the industry would call “a rookie mistake” by Googling his name and the series to see what people were saying. He came across my columns and was very thankful for the support. Besides “Grey’s Anatomy,” this is the only ABC series to feature an Asian character whose storyline actually impacts the show. And besides its sociological significance (an Asian guy “getting” the girl with another one competing for him), it’s just fun to watch every week. Don’t let me down, Paul! Too Good to Be True Department: A few weeks ago, I was happy that an episode of “Hawaii Five-O” actually lived up to my expectations of a show set in the 50th state: The AA regulars got ample screen time, there were a lot of AA guest stars, and the haoles didn’t dominate because in Hawaii, in reality, they don’t. I considered writing a letter to CBS to praise them for it. But something told me to wait for the next couple episodes to see if this was a trend or just an anomaly. Sigh. It was the latter. In last week’s episode, Steve McGarrett (Alex O’Loughlin) and his white girlfriend, Catherine Rollins (Michelle Borth), went to South Korea to get arms from… who else? The very white Jimmy Buffett (yeah, I know, when you think of Korea, you automatically think, “Jimmy Buffet!”). All so they could retrieve the body of McGarrett’s Navy SEAL (also white) from the terrible North Koreans. The head of the camp was played by poor ol’ Rick Yune, who’s still in theaters portraying the North Korean terrorist in “Olympus Has Fallen.” Can’t he get work playing anything else? The entire episode featured just McGarrett and Rollins except for a minute with Chin Ho and Kono via speaker phone and a few more minutes with Danno (Scott Caan). That’s it. Then this week, we followed the case of young girls who’ve gotten kidnapped and kept under wraps for a decade. In both cases, they’re white. A motorcycle gang offers to help Five-O. They’re all white too. The biggest guest roles for Asians? Two guys who almost shoot Kono, looking for a guy who’s tied to the yakuza. Greaa-ttt. Nope, no letter necessary. Just business as usual for executive producer Peter Lenkov, who wrote this episode, once again ensuring the audience continues to only care about white people. Wake me up when there’s an Asian Pacific Islander to save, OK? Wait, What? Department: For months, people wondered why Ben Kingsley (you’re no Sir to me, mister!) was playing the Chinese character the Mandarin in “Iron Man 3” when he’s half Indian and doesn’t come close to passing for a Chinese person. Well, it’s not explained in the actual movie. 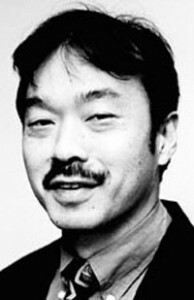 His character’s impact on Asian Americans? Probably nil, especially given a surprising reveal about him (I won’t ruin it for those who haven’t yet seen the superhero action flick). Ultimately, though, it would’ve been better to have a Chinese-looking actor play the villain.